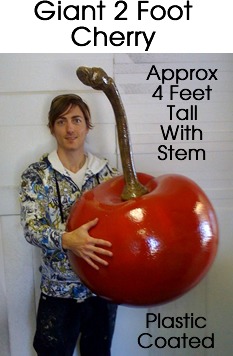 2 Foot Cherry Foam Prop - Dino Rentos Studios, INC. This full 3D cherry is plastic coated for durability. Great for retail displays or as a theming element to a facility. Cherry is plastic coated and sealed with a gloss coat. Stem is detached for shipping. Note: Items over 30 IN Tall may require additional shipping charges.